She's doing very well.. Still wants to move a lot, whitch is normal for her age; she's just an active little girl. Her kidneys are working efficiently now. 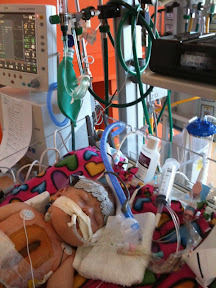 J.
I hope today is a day of great healing for Abi, and I hope her parents get to rest, too! 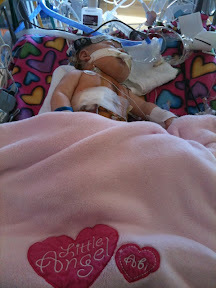 Such great news that her chest may be able to be closed sooner rather than later! So glad to hear her kidneys have kicked into gear. Connie's took awhile and he had to be put on a continuous drip of two diuretics to get them going, but they did eventually. That should help keep her swelling down some too! Prayer that the closure goes well and she can come off the vent sooner than Monday. I think Connie was on it for three days post op after the DS, but he had had a seizure so that may have postponed it a bit. She looks great. What a fighter!